It all ended after World War Two. Or so it was thought. While medical and physiological experimentation on humans was repugnant and against all sensibilities, it remained valuable and above all highly profitable. Just simply believing something had gone away was good enough for most. Not for Milo Moon and Mary Seaton, who became proof of an international conspiracy to hide the truth. Simple and childish they may have been, but they held a history in their beings that was a threat to international political stability. For the Swiss government faced with such a discovery on their soil, the art of politics necessitated compromise and calculation to find a solution. A viable outcome that gained maximum political benefit of course; which is the habit of seasoned politicians. However, above all this had to remain a secret and be buried again behind the walls of political cloak and dagger, secret services and a need to protect the sensitivities that we call modern history. Therefore, it never happened. This is actually a great idea for a book. Political intrigue meets cover ups and conspiracies. There was a great deal of international political instability mixed in with some dumb but likeable characters. I think this is what carries the book; mixing a believable but odd character like Milo with an international secret concerning human experimentation. What more could you want from a suspense horror politically intriguing novel. 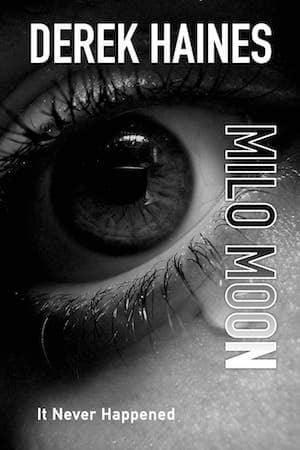 When it comes down to an edge-of-your-seat action, conspiracy theory mystery, Milo Moon most definitely packs a punch, and so far it has delivered. It has everything you need for a good novel. I am a fan of conspiracy theory novels, because it is so easy for me to get caught up in the mystery and intrigue and getting lost between the lines of fiction and fantasy. The action begins on the very first page, but continues to build throughout the story, creating mystery and deception. Milo and Mary Seaton become entwined in an international conspiracy plot, as well as victims of political anarchy, as a secret is revealed by the Swiss government. The author has created strong characters and rich story-telling. The action scenes were probably my favorite part of this book. The way Haines walks you through the intense story-line makes you feel like it is being played out right in front of you. Milo Moon has something for everyone. There’s a conspiracy theory, suspense, political intrigue, a little bit of romance and above all some really good story telling. The Swiss government are faced with a dilemma when a police officer unearths a shocking secret upon meeting Milo Moon and Mary Seaton. Derek Haines carries you through the story with ease and has a great knack of building suspense, I found it quite hard to put the book down at times. He writes in a way that makes you care about what happens to his characters, even the not so nice ones and he describes Milo and Mary’s child-like wonder at their new world with humour and a touch of sadness. There are touches of George Orwell and Iain Banks in Derek Haines’ writing and at times this book reminded me of films such as Logan’s Run and more recently, The Island. A thoroughly recommended read.